A real leather jacket or coat is usually a costly investment but it can last for many, many years if given proper care. In many cases, you can wash a leather jacket at home if you follow the correct methods. It is important to understand the type of leather you are purchasing and to be sure that it is real leather. Many synthetic products can look very similar but the type of cleaning and care is much different. Suede: Natural suede leather is created from the soft underside of a split grain animal hide. It has a nappy finish that is easily stained. There are specific care and cleaning steps for suede jackets, accessories, and furniture. Aniline: Aniline leather is a full grain leather that has been treated with the chemical aniline. This is the most common type of leather used for jackets. Nappa: The highest grade leather, nappa leather is very soft, supple, and uses a full grain sheep or lamb hide. The key to keeping your jacket looking its best is to be sure that the leather is properly treated with a leather protector. You can purchase leather protector products in both liquid or spray-on formulas. The protector helps repel water and prevents stains on the leather surface from water spotting and soil. The protector products should be reapplied at least yearly or more often if your coat is frequently exposed to harsh weather. Never cram your pockets full of "stuff" or carry heavy items because it will stretch the leather. Do not apply hairspray, perfume, or cologne while wearing your leather coat. The alcohol will dry out and stain the leather. Use the products and allow them to dry completely before putting on the jacket. Never attach badges, pins, tape, or stick-on labels to leather. It will mar the finish. Have a professional do any size alterations or attach any emblems or embroidery to the leather surface. Holes caused by incorrect stitching are nearly impossible to remove. If your leather jacket has been properly treated and protected, most soil can be wiped away with a clean, damp cloth. Of course, removing tougher stains like mildew or ink from leather require specific treatment. But what should you do if the inner lining is soiled with body oil and perspiration? If the coat is quite expensive, new, or you are a total laundry novice, head to a professional leather cleaning expert. Always check the credentials of your dry cleaner. Not every storefront is qualified to clean leather. However, if the inner lining is made of a washable fabric (read the fabric content and care labels), you can hand-wash your garment at home. CAUTION: Hand-washing is appropriate for aniline leather finishes only. Never wash suede or nubuck garments. Before you give this a try, test the color-fastness of the leather using a clean, white, wet cloth on an interior spot of the leather. If color transfers to the cloth, the dye is not stable on the leather and you should not proceed. 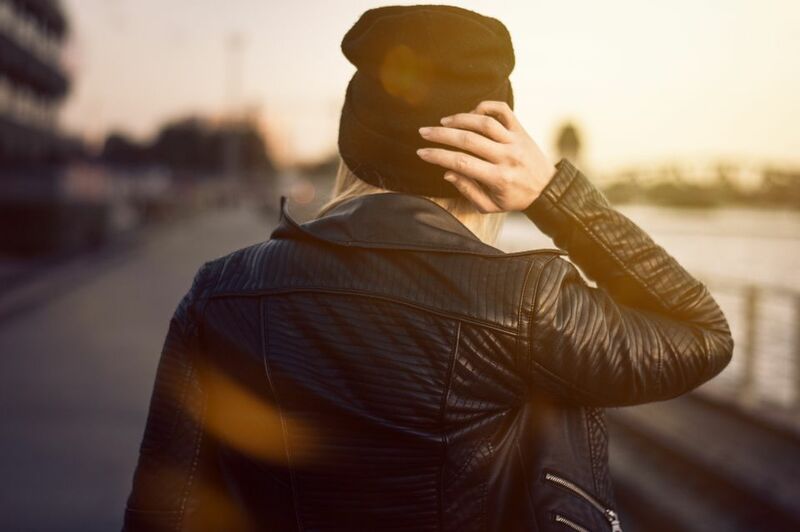 If you decide to wash your leather jacket at home, you will need to be prepared to devote several days to the process and properly condition the leather after it has been washed. Think about your own skin. Leather is the skin of an animal. If you dry it out with harsh soaps, it will crack and feel stiff. Begin by emptying all pockets of the jacket and turn it inside out. Fill a large sink or plastic storage container with lukewarm water. Add a small amount of a gentle liquid detergent recommended for hand washing delicate items (like Woolite) and swish to disperse through the water. Completely submerge the leather jacket. Swish through the water to be sure the entire lining is wet. Gently squeeze the solution through the lining. Allow it to soak for ten minutes or so. If there are specific stains, use a soft bristled brush to help lift those away. When it is time to rinse the jacket, lift the jacket out of the soapy solution. DO NOT WRING. Simply squeeze out the excess moisture. Fill the sink with clean water and rinse. You may need to change the water several times to remove all of the soap and soil. After you have washed your coat with a gentle detergent, turn it right outside and hang it over a bathtub to air dry. Use a sturdy wooden or padded hanger to prevent marks on the shoulders. Never hang in direct sunlight or near a heat source. It may take two to three days for the coat to dry completely. The next step is to completely condition the garment until it is once again soft and supple. Be sure that you use a good quality leather conditioner. If your leather jacket has gotten soaked by rain or snow, follow the same steps for air drying and treating with a leather conditioner. Storing your coat properly will prevent many problems. Again, use a wide, sturdy hanger to support the weight of your coat. Coats should be stored in a cool, dry area away from direct sunlight. Avoid any location that has excessive moisture-even a closet near a bathroom. If you are concerned about dust, cover the coat with a cloth garment bag or cotton sheet. NEVER store in a plastic bag that could trap moisture and promote mildew. Avoid ironing if at all possible. If you must iron, use a cool to medium temperature iron and pressing cloth over the leather. Too much heat and you'll have a permanent shiny iron print on the leather.